Jim Robertson featured in our 4x4 portfolio recently and I asked him if he could answer some questions for our featured photographer section. And fortunately for us he did! An interest in painting led me to explore photography and I went through the Zenith E introductory route. Later that was followed by a Nikkormat Ft2 and it was that camera which filled me with an enthusiasm for making photographs and for black and white processing and printing. I still have a Durst enlarger etc. in the loft. Anyway, don’t ask me why, I sold the Ft2 and bought an Olympus oM1 which I also still have along with a couple of lenses although I never use it now. Maybe one day. So, for me, the discovery of the SLR was very important. Another discovery was that the landscape photograph can be compiled of elements and not just be seen as an overall composition straight away. So that if one breaks the photograph down into foreground, middle ground and background it becomes easier to construct a satisfying image by examining the relationship between each and all of these elements. Maybe wide angle lenses play a significant part behind that way of thinking but it’s certainly something which I try to pay attention to although I don’t think I do it well enough. 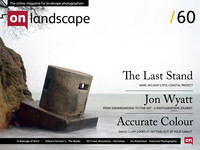 Interesting that you say landscape photography. I tend to think of myself as a seascape photographer and I'm never really sure if landscape and seascape are one and the same. Yes that old argument! Some might say that that is restrictive but for me that's why I love photography really. There's something about being in close proximity to the sea which fascinates me. Andrew Nadolski talks about it in his beautiful book 'The Edge of The Land'. The sea is never the same, the foreshore is also always changing and there is that inherent power which the sea has. Calm one day maybe but so violent the next that it can really scare you. Sound does plays a huge part as well. The booming sound of giant waves as they crash against rock and the roar at high tide. Then there's the nature which survives on and around the foreshore. The geology also fascinates me. I could go on but enough to say that I feel lucky in that I live beside the sea and near to some great locations for photography. It's the sea which pulls me out there and gets me making photographs so I suppose that's why I love seascape / landscape photography. That and a desire to create. My first passion was for painting and I should really have gone to art school but I required additional qualifications in order to get there. In other words I didn’t work too hard at school. I did get the qualifications required but by that time I was working for the MOD and I let the opportunity slip. Something I always regret. I’ve painted on and off for years. At the moment it’s off. I quickly left the MOD and joined what is now Scottish and Southern Energy as a cartographic draughtsman, became qualified in CAD, and eventually ended up in the telecommunication side of the business as a mobile telephone base station designer. I worked with the company for almost thirty years before reluctantly accepting redundancy aged 49 in 2002. I had a hand in the design, planning, construction and post-construction phases of most of the T mobile / Orange masts in Scotland but don’t blame me if you find them obtrusive. During those times I made lots of photographs of hills but not a landscape photograph amongst them! Following on from that, and after trying hard to get back into design but I think hitting the age discrimination thing, I worked as a caretaker in Elgin Library and it was there that I first met with Ian Cameron when he exhibited in the gallery there. I worked there for six years then had to leave due to back problems. Now I’m 60 and retired although I still keep my hand in with CAD. I had a Nikon D80 for a good few years but I always had an inkling for full frame and the Nikon D700. I held off from purchasing for a good while expecting an upgrade to the D700 to appear but that never came. Then along came the D800 and I jumped. I use the 5:4 (30.0 x 24.0mm) image area option most of the time with the D800. Wide-angle tends to suit my photography and I have a Nikon 16-35mm f4 G and a Nikon 24-70mm f2.8 G. I’d like to sort out the overlaps and I know that I’ll move to primes eventually. I use a Gitzo GT3532LS Series 3 6X tripod combined with a Really Right Stuff BH-55 LR ball head and Really Right Stuff L plate on the D800. That combination is a pure joy to use. I also use a Nikon MC-30 remote cord most of the time and I still like to use ND graduated filters. There’s no doubt in my opinion that to get the best out of the D800 at base ISO and under typical landscape photography lighting conditions that one has to slow down the capture process. Not a bad thing I’d say. I’m not sure how the lens and body combinations affect my photography. Both of the above lenses appear on the Nikon list of recommended lenses for the D800E and I haven’t seen a recommended list for the D800 but suffice to say that I’m very happy with the image quality. As little as possible RAW processing in Lightroom 4 then exported as 16bit RGB TIF to CS5 for final tweaks. Resizing, output profiling and sharpening in CS5. I would like to process them further in Lightroom maybe. I process for print as I see the print as the final stage in the creative process. Images for the web are one thing but they can show so little and mask so much. Put another way one is never going to see the detail in a D800 image sized to 800px when viewed on a screen at 72dpi. There’s no hiding with a print. In saying that I don’t do my own printing and to do that should probably be the ultimate goal but I know that it’s not for me at the moment and maybe never will be. Usually I have them printed at 15 x 12 and I ‘T’ mount and double matt and frame them up as required. I briefly touched on it earlier on but the work of Ian Cameron really brought me back into photography and certainly steered me down the landscape road. When I saw the first exhibition of his work it really blew me away and the quality of his work got the photography juices flowing again. His work still blows me away. He’s got such a fantastic eye for a photograph and everything about his work exudes quality and professionalism. Over the years I’d say that we have become fairly friendly and I value that. I know that if I were to ask him for his advice or help that he would get back to me with the answer. He has always been very helpful and supportive towards me. I see him as being a traditional landscape photographer. By that I mean no fads or gimmicks just honest and beautiful landscape photography but with that extra can’t put your finger on it something that makes a photograph into art. Quality photography. For me Joe Cornish fits that above description as well which leads me onto ‘First Light’. Now there is a book that would stimulate and inspire anyone! I remember meeting and talking to Neil Gove the landscape photographer based in Balmedie, Aberdeen. We were talking about Elgol and Joe’s cover picture with the stone. ‘Aye you’ll find it eventually Jim. It’s not very big and it’s not very round’. Well I did find it a few years back and Neil was correct. It is not very big and not very round. That makes it all the more remarkable that Joe saw the composition in the first place. I think most of us would have scrambled on past to be honest or had our eye taken with the thrift if it was the right time of year. The intimate landscapes of Hans Strand inspire me and I like his ideas about finding locations close to home as most of my photographs are made no further than 5 miles from my home in Lossiemouth with some just 5 minute’s walk away. Findhorn would be the furthest away and that’s only 15 miles. In saying that I appreciate how fortunate I am to live in close proximity to the sea. I don’t have any of his books but Peter Dombrovskis photographs are very special and none more so to me than ‘Giant Kelp, Hasselborough Bay’ closely followed by ‘Dunes And Gravel near Interview River’. Again it’s the intimate landscape concept which I find interesting. His photographs often have a look of simplicity about them but then that’s how it is when someone does something exceptionally well. ‘Catching The Tops’ was one of those photographs where one visualises the result beforehand and plans accordingly. I had to wait a few weeks before the tide and light synchronised and was lucky to get fairly large waves on the evening it was made. It just all seemed to come together. It was judged second in the landscape section of the Scottish Nature Photography awards a couple of years back so that was very satisfying. We have a stretched canvas of it on our lounge wall so it’s a photograph I live with daily. It was made close to Hopeman which is a little village located just to the West of Lossiemouth. ‘Seatown Frost’ is a photograph which pleases me. There was a freezing fog that morning and I had spent a while on the East beach at Lossiemouth trying to make something of the unusual weather conditions. When making my way back across the footbridge the sun peeped out through the fog for a few minutes and I saw the photograph. You can see the marks left by my hands when I made my way over the ice covered bridge to get to the beach earlier in the morning. It’s a photograph which has become very popular locally so I’m really pleased with that. Benromach Distillery have used it along with ‘Catching the Tops’. It’s a photograph which reminds me that ‘no pain no gain’ can often be the case when adverse weather conditions prevail. It was very cold on that morning and hopefully that feeling comes across. ‘Twelve Pebbles’ is another favourite. I included it in ‘4×4 Portfolios’ - On Landscape #55. I just like the warm to cool tone progression and the variation in the colour and texture of the pebbles. I used to play golf but my back problems stopped that. To be honest I only miss the social side of the game. I could get the paints out and I have an old ‘f’ hole Gibson which needs some care and attention. My wife Kath and I have a Golden Retriever so I’d probably walk her more than I do already but even then it would be hard to be on a beach without being able to scout a bit so I’d have to take her somewhere else I think. I’m not sure that photography is just a hobby with me but I can switch off from it. At the right time of year I would do some mushroom foraging. Our children are well and truly grown up now but they still remind me sometimes of the times when they were a lot younger and I used to drag them to the woods to look for mushrooms. My daughter says that she could tell the difference between a false chanterelle and a real chanterelle when she was five! All part of a rounded education I tell her (cough). I’ve never been a member of a camera club but I have been asked a few times in the past to talk at camera clubs but I always politely declined the invitations. Last year however I took the plunge and accepted one such invitation. It seemed to go down fairly well and I managed to ramble on for two hours. Mind you it was dark and they may have all been asleep! The funny thing was that I really enjoyed myself so I might take on more of those in the future. I’m a great believer in putting something back into photography in response to the help which I have received down the years so I might do something along those lines. I have another exhibition coming off in September of this year and until it’s hung that will be a challenge. Still I think it’s important to try to get work out there if only for the feedback if nothing else. It will be the third exhibition so I know what to expect and I’m lucky to get the opportunity. As for subject and style I think both of those are better left to evolve naturally. In saying that I can’t see me staying away from the coast for long. I often see photographers jump into what is the popular subject of the moment but that’s not for me. Intimate landscape photography fascinates me so I’d like to see what happens along those lines. I also have a couple of ‘projects’ on the go and one could say that, because my photography is confined to such a small location, it is in itself a project. Still developing Tim! Now where have I heard that before? I would say Ian Cameron but that would be better left for one of your interviews I think Tim. I mentioned Neil Gove briefly so let’s go for Neil if he’s around. You can see more of Jim Robertson's photography at his website http://jimrobertson.co.uk/ and follow his adventures on Twitter @LossiemouthPhoto and on Google+.